PT Telkom Akses - PTTA or referred to as "Telkom Akses" is a well-established information technology (IT) company in Indonesia with rapid business expansion. 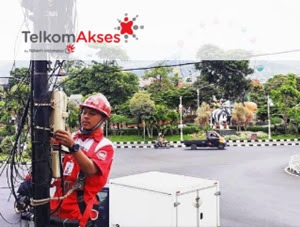 Telkom Akses is a member of PT Telekomunikasi Indonesia Tbk (Telkom Group) and has core business competencies in 3 business pillars; construction, managed services and trading in the field of telecommunication. Telkom Akses engaged in providing construction and fixed-broadband network infrastructure construction services. Its business include broadband network installation, network terminal equipment (NTE), and operation & maintenance (O&M). According to information found in the Company's website as cited by JobsCDC.com, Telkom Group holds 99.99% shares in Telkom Akses. PT Telkom Akses was founded on 26 November 2012 and commercially operate on February 2013. Based in Jakarta, Telkom Akses runs its business through its five regions spread across Indonesia; regional area Sumatera, regional area Jakarta - Banten, regional area West Java - Central Java, regional area East Java - Bali - Mataram - Kupang and regional area Kalimantan - Sulawei - Maluku - Papua. Its head office is registered at Jl Letjen S Parman Kav 8, Grogol, Petamburan, Jakarta 11440. Candidates from all levels are welcome to apply, with major in Computer Networking or other related to position. Advanced knowledge about the concept of TCP/IP, Subnetting, VLAN, Routing, SMB, C Panel, Device troubleshoot (PC/Laptop, Server, etc), IP PBX, Wifi, Cabling. Advanced knowledge about the command language CISCO and Mikrotik. Able to work independently, and have a high learning desire. Hold an appropriate degree (industrial/telecommunication engineering) or equivalent management qualification. Strong analytical skill and able to impart detailed data to others. Good interpersonal skill to build and maintain relationships with other staff at all level. Methodical, systematic approach with a good eye for detail. Able to deliver by planning work and setting targets for the achievement of abojectives. Good understanding of current public sector policy issues. Able to think strategically, self-motivated, creative thinker, innovative, fast learner and hard worker. JobsCDC.com now available on android device. Download now on Google Play here. Please be aware of recruitment fraud. The entire stage of this selection process is free of charge. PT Telkom Akses - IT Infrastructure, Business Analyst Manager Telkom Group March 2018 will never ask for fees or upfront payments for any purposes during the recruitment process such as transportation and accommodation.